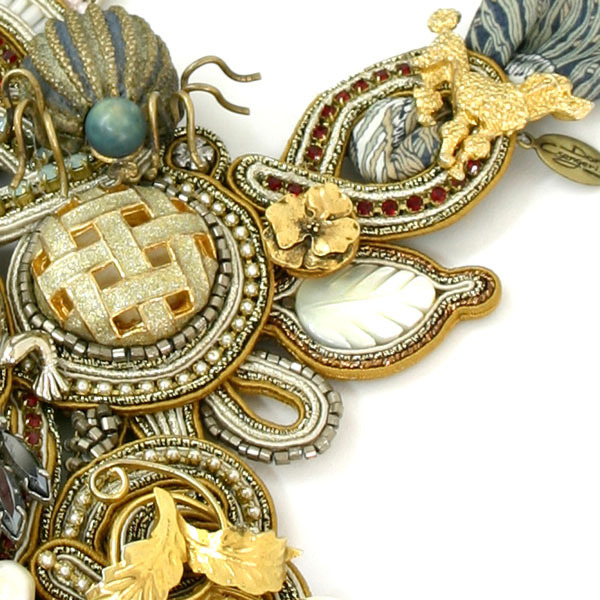 Dori Csengeri is the creator of some incredible hand-embroidered jewellery pieces amongst which is a jaw-dropping vintage collection that is called The Ephrah Collection. This is divided into two distinct groups. 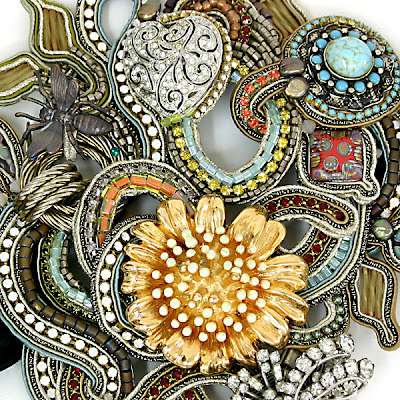 The 'Exceptionally Dori' group includes one-of-a-kind pieces which are collectible. The other group is the Ephrah ready-to-wear collection. The collectible pieces are an assemblage of true vintage parts (brooches, earrings and other jewellery parts) which are all encapsulated with special embroidery stitches. The ready-to-wear items on the other hand are made of vintage-style parts, so the pieces can be remade. Dori is an avid flea market treasure hunter. Additionally, friends and family members who know about her love of vintage pieces, keep 'building-up' her vintage treasures collection (wish I had friends like that!). When I contacted Dori I asked about what it takes to make the haute couture pieces and I was told this is a long creative process. Dori embroiders each of the pieces spontaneously without a preliminary design, adding vintage parts, stepping back, taking pieces apart, making changes and so on. It is impossible to know how many hours each treasured jewel takes to be completed. Likewise, each jewel comes with its individual collection of vintage components, making every item different, completely different from all the others. Each collectible necklace for instance can cost between Euros 2500 - 3600. Staggering prices to be sure, but these are haute couture items with just as staggering an impact. I mean.... have you looked at them well!?!? Try to spot the individual vintage components in the necklace (sold to a private collector) pictured above in the first picture - you will find a golden French poodle brooch, a green patinated spider brooch, the delicate gilded mother-of-pearl vine brooch......and a man's necktie! In the second picture you can view a Dori Csengeri bracelet (sold to a private collector) which contains amongst others, the following vintage components: a sparkling heart, a great golden flower, a circular turquoise pin and a dazzling starburst element.